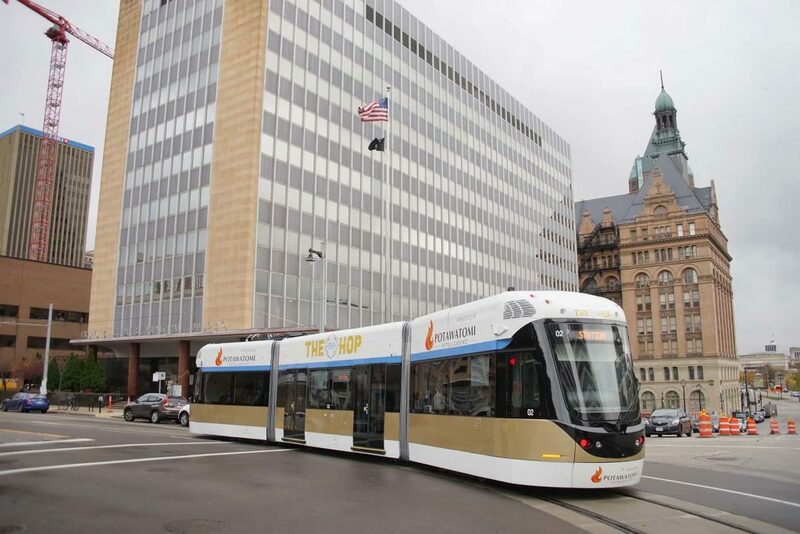 Downtown Milwaukee turned a corner at one of its most historic intersections: 3rd Street and Wisconsin Avenue, with its latest reincarnation. 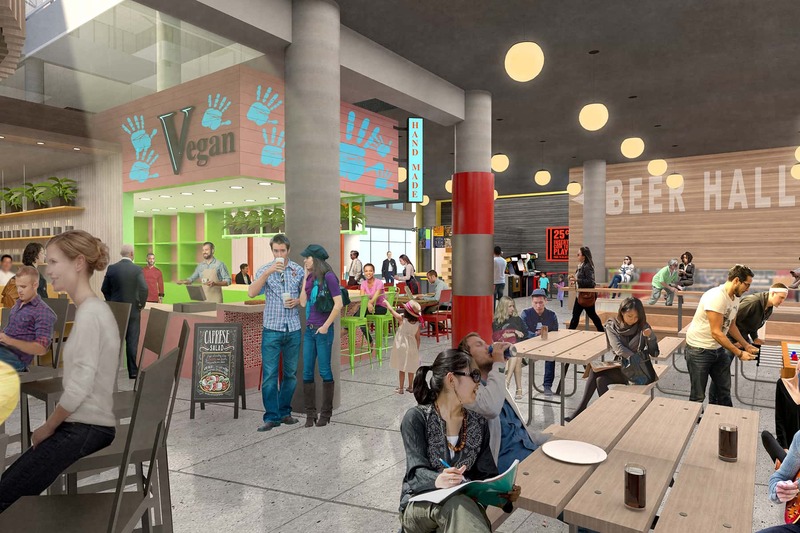 New plans were unveiled on December 6 to transform the former Shops of the Grand Avenue into an array of reimagined spaces, from a food hall to refurbished offices and apartments, to engaging new retail concepts. 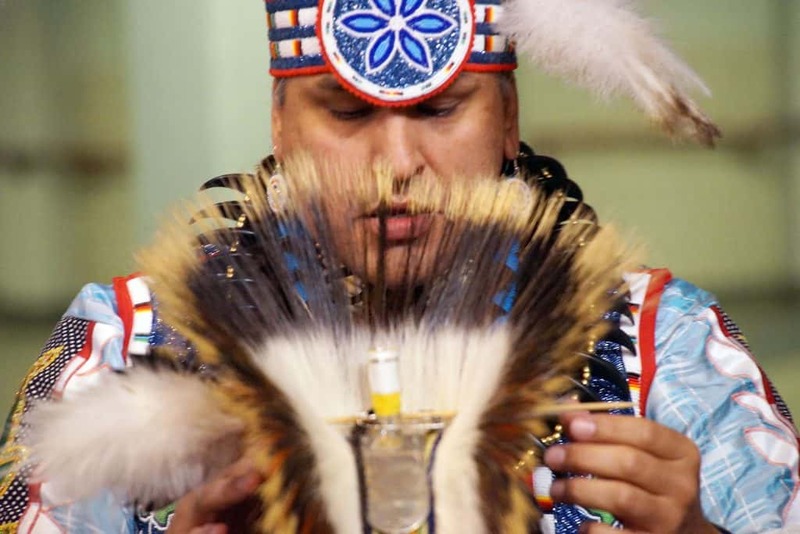 Known as the Shops of Grand Avenue, the site will be rebranded simply as The Avenue, a refocus on its central location and recognition of its role in downtown. 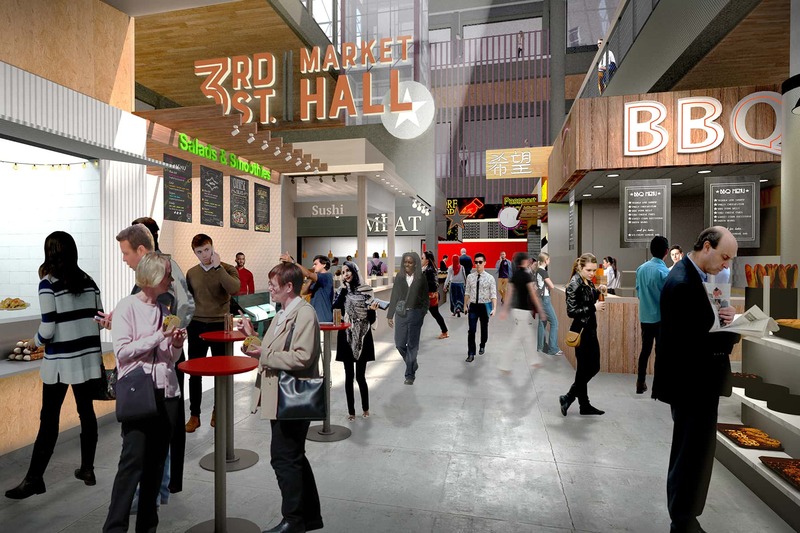 At its heart will be 3rd Street Market Hall, a street level 35,000-square-foot food hall. 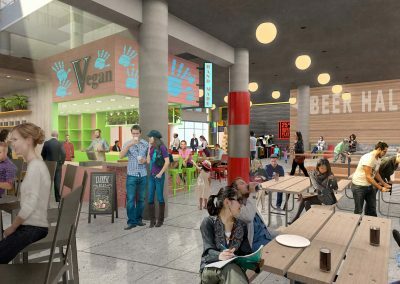 Spearheaded by Milwaukee restaurateur, Omar Shaikh, the food hall will feature more than 20 vendors that reflect the cultural and ethnic diversity of the region. 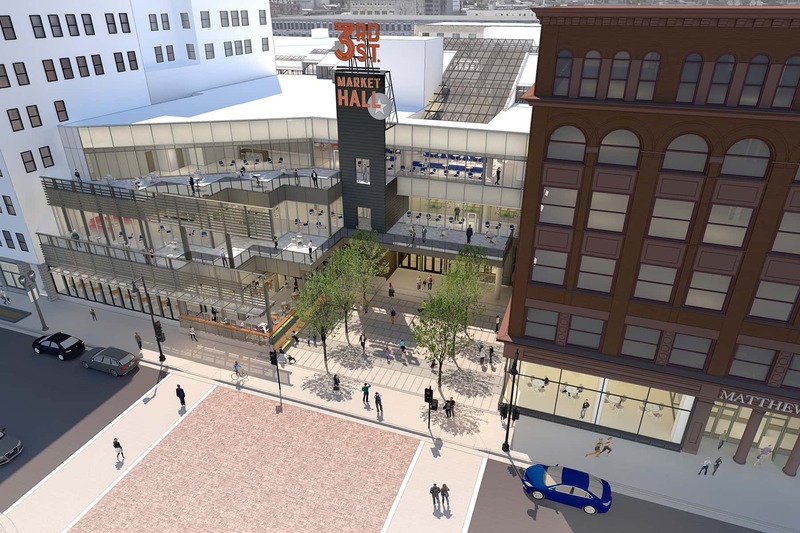 3rd Street Market Hall will include a special event space to support culinary experimentation, as well as a platform for Milwaukee’s new and upcoming talent. 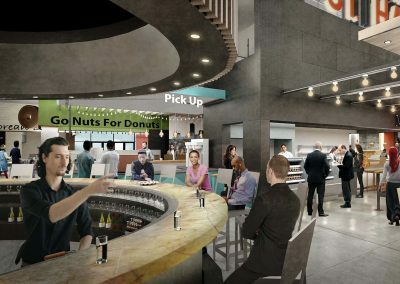 It will also contribute to Milwaukee’s growing reputation for innovative cooking and dining experiences. 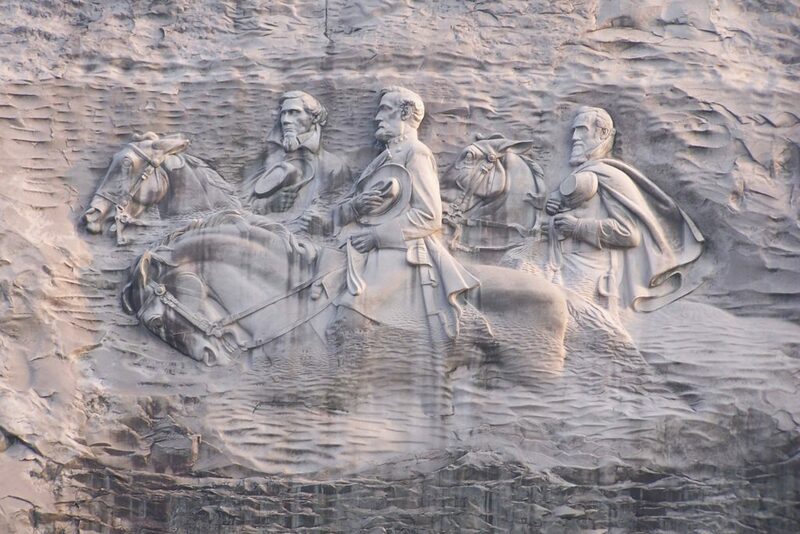 Milk Can. 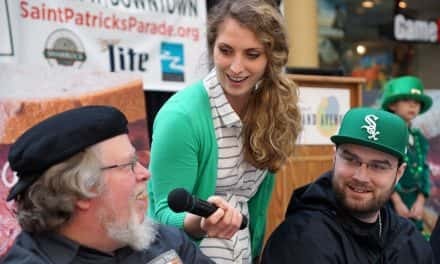 A start up concept by Milwaukee chef Kurt Fogle and the team behind Muskego’s Bass Bay Brewhouse. With Wisconsin roots the partners are linked by a common passion: hometown classics—like burgers, cheese curds and custard reimagined and made better from scratch. Funky Fresh. Funky Fresh Spring Rolls are handcrafted spring rolls made with fresh and local ingredients, and never deep fried but grilled in healthier oils. 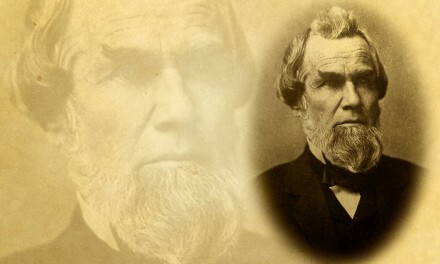 Founder Trueman McGee strives to bring not only delicious meals but nutritious options to his customers. Donut Monster. 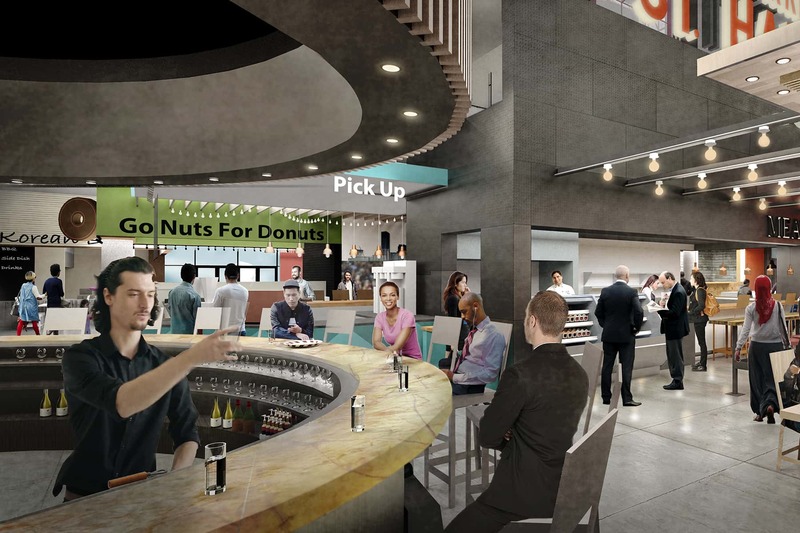 Chef Jackie Woods along with his wife Sara will open a permanent Donut Monster pop-up at 3rd Street Market Hall. Made daily from scratch with the best available ingredients, these donuts are beloved for their natural tastes of quality fruit. Char’d. The non-traditional menu is rooted in familiar Korean flavors while showcasing Chef Yosub Yoon’s remarkable creativity featuring everything from super rice bowl dishes to quick bites like Korean fried chicken wings. Waterford Wine & Spirits. Founder Ben Christiansen will offer a curated tasting and purchasing experience, Waterford’s authoritative collection is unmatched in the region. 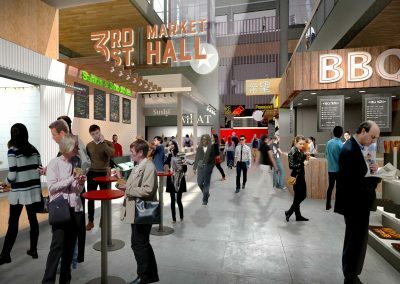 Further differentiating 3rd Street Market Hall from other urban food halls will be its central bar and engaging areas for friends and family activities like ping-pong, bocce, and even a giant Jenga. The complete reimagining of the former mall received a huge boost with GRAEF’s commitment to relocate its office to The Avenue. 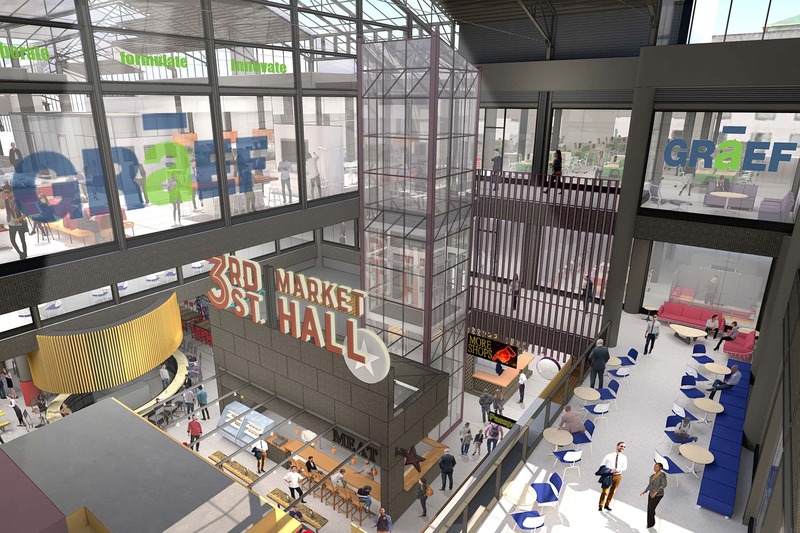 Much of the facility’s historic space will transition to new offices designed to facilitate the exchange of goods, services, ideas, and deal making in the heart of the region’s commercial hub. 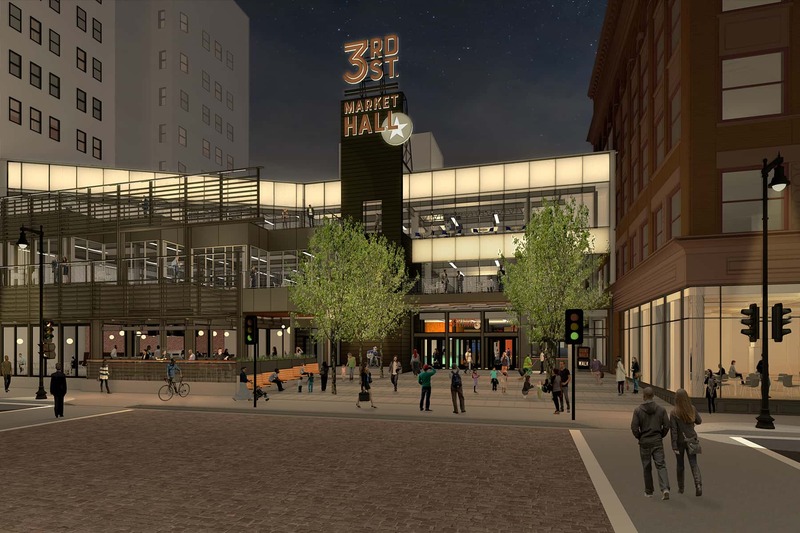 The Milwaukee-based national engineering, planning, and design firm, will occupy nearly 35,000 square feet, which is more than 60% of The Avenue’s third floor space. The Avenue will provide GRAEF with the opportunity to put its commitment to sustainability and the environment into practice in its own workspace. GRAEF also sees its space at The Avenue as an opportunity for increased engagement with its 170 Milwaukee-based employees, from creative, forward-thinking workspaces to downtown amenities that include access to a state-of-the-art fitness center, a 100-seat innovation event center, a tenant lounge, parking, and quick access to a world-class food hall. The Avenue’s planned contribution to downtown living takes shape as the Plankinton Clover. 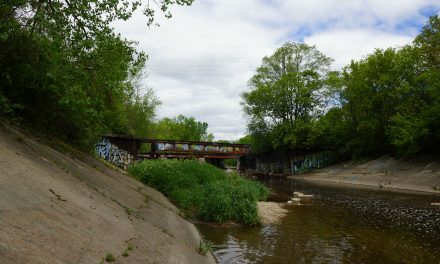 It will feature 52 apartment units ranging in size from studios to two bedrooms. Following the concept of “work/live” units from the Germania Apartments a block north, the apartments will make use of their historic Plankinton Arcade environment. Floor to ceiling windows will be introduced that overlook W. Wisconsin Avenue, N. Plankinton Avenue, and N. 2nd Street. 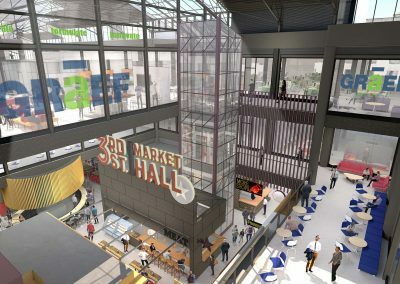 Most units have entrances from common corridors that connect to the second floor atrium, which will transform the atrium into a public street in the middle of a neighborhood. Plankinton Clover amenities include The Avenue’s dog wellness area, fitness center, a tenant lounge, a private movie theater, and access to the convention center. 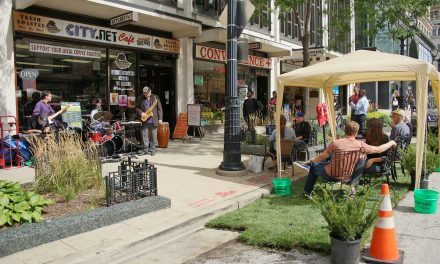 Along with the other dynamic developments in the Westown neighborhood like the Buckler, the Century Building, the Milwaukee Symphony Orchestra (MSO) redevelopment of the Warner Theatre, as well as the opening of Fiserv Forum, the area is becoming a catalyst for expanding Milwaukee’s vibrancy.